Talk about snatching defeat out of the jaws of victory! NOTE: Shane Windmeyer is a homosexual activist and the founder and executive director of Campus Pride, which aggressively pushes for the acceptance of homosexuality, bisexuality and transgenderism on college campuses. Gee, what a shock that Windmeyer wants his friend, Dan Cathy, to SHUT UP about homosexual “marriage”….Lesson for pro-family advocates: in my experience, when Christians “dialogue” with homosexuality activists, the “gay” activists usually end up winning the most concessions and biblical values are compromised. 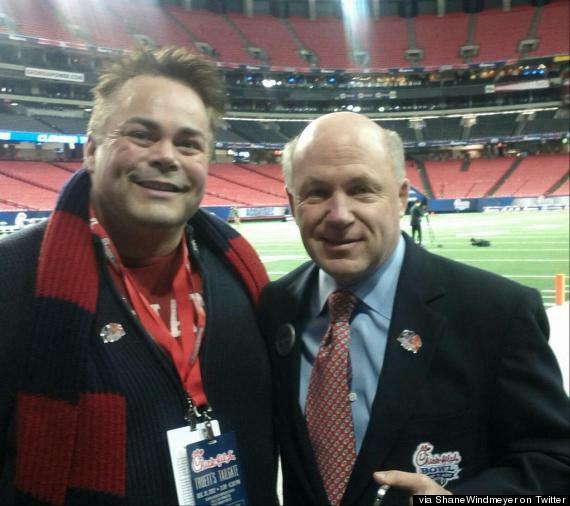 Gay Activists Stay Vocal; Christian Leader Goes Silent: Chick-fil-A’s new CEO, Dan Cathy (right), befriended homosexual activist and Campus Pride executive director Shane Windmeyer in the wake of the media hubbub over Cathy’s defense of natural marriage. Now Cathy has heeded Windmeyer’s advice to pull back from publicly from the homosexual “marriage” debate. Photo: Huffington Post. I told Bryan that Cathy “sold out” all those good Americans who–after all–had rallied by the hundreds of thousands to support his RIGHT TO SPEAK OUT for God’s natural design for marriage as between a man and a woman. I mean, isn’t that why so many people showed up on “Chick-fil-A Appreciation Day”–because we were sick and tired of people of faith being silenced by homosexual militants and their pro-LGBT media enablers? Also, the Journal-Constitution reports, ”Progressive website Think Progress earlier this month reported that Chick-fil-A’s foundations — WinShape Foundation and its namesake Chick-fil-A Foundation — “dramatically” cut donations to groups gay marriage supporters consider anti-gay.” AFTAH will be checking into this as well. How sad if this is true. One last thing: isn’t it interesting that PRO-homosexual-”marriage” execs like Starbuck’s CEO Howard Schultz don’t retreat from publicly speaking out FOR counterfeit “marriage”? In fact, liberal corporations are more sold out than ever in publicly supporting–and funding–All Things “Gay”–so once again it’s the Christian, “pro-family” side that is engaging in unilateral surrender in the battle for Truth on homosexuality and marriage. Meanwhile, the Homosexual Lobby is louder and more aggressive than ever in pushing its lies and demands! AFTAH will have much more on this story and other examples of Christian defeatism in the Culture War.